How do you build a company that has viral growth?Paperless Post’s Alexa Hirschfeld and Lucy Deland took a crack at explaining it last night at the New York City Viral Media Meetup. Their company deals in e-cards and party planning, and viral marketing is a big part of their growth. “You need to share exceptional content and include a means to distribute it to others,” said Deland. She emphasised that they were very specific about the quality of artwork that they make available to their customers for their cards. They only take the best. As for mechanisms to distribute the material to others, Hirschfeld talked about including links for tweeting and sharing the item on Facebook. Eventually this harvests a community of people that continue to share with each other. 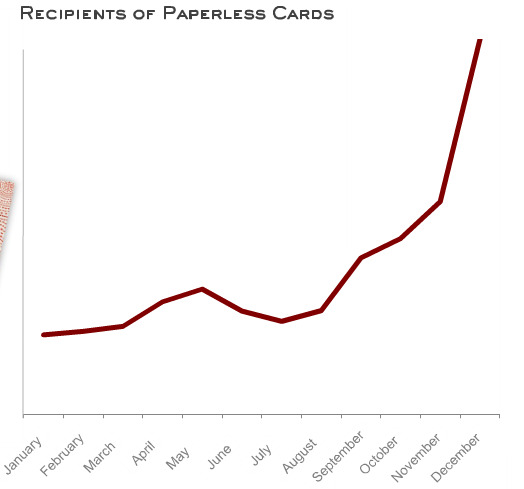 Paperless Post currently handles eight million cards a month in large part because users send them to each other. Hirschfeld and Deland added that 30% of Paperless Post recipients have received two or more cards. The likelihood of someone joining increases 150% after receiving the second card and jumps to 225% when they receive the third. They are building a community that services itself. “Incestuousness is ideal,” she said.